Senator Dino Melaye has told a court that he tried to escape from the convoy transporting him from Abuja to Lokoja because he had reason to fear for his life. 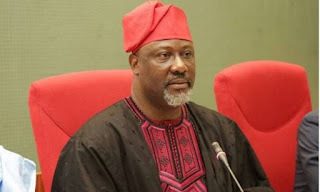 Recall that the Senator had been arrested on suspicion of distributing arms to political thugs to disrupt political activities in Kogi state and while on the journey he jumped from the vehicle purportedly in an attempt to escape from the police. He then injured himself and had to be rushed to the hospital. The senator made this known in an affidavit filed before a Lokoja High court by his lawyer, Mike Ozekhome, SAN where he averred that he had suffered from the use of tear gas and was in fear for his life. His bail application was adjourned with the presiding judge stating that he would need to study the facts of the case alleged in the court documents.